I was very pleased with this product. The size, color and quality exceeded my expectations! Dimensions 173.0 In. X 120.0 In. X 0.25 In. This rug just arrived and when we opened it we thought it was the wrong one. It is a very light cream with a little bit of blue, the darker stripe almost nonexistent. So much lighter and very little contrast than the main picture shows. It won’t last long at all with dogs or people actually walking on it in our family room. Might be great in a room with little use as it is pretty, just not paractical for what we thought we were getting. My main issue with the rug is the dimensions are off. The rug we’re replacing is 9’10 x 12’9. 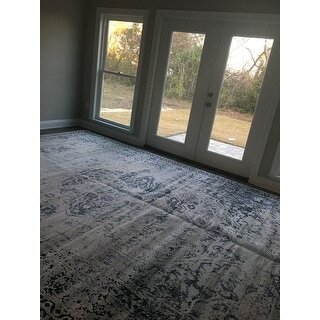 This rug which is supposed to be 10 x 14’5 and it is actually 9’5 x 14’5. We thought we would be gaining a couple of inches which we needed, instead we lost 5. Now some of our furniture is sitting half off the rug making this a bust. We can’t reconfigure our furniture, we’ve been trying. I spent more money to get a bigger rug and didn’t really get one. 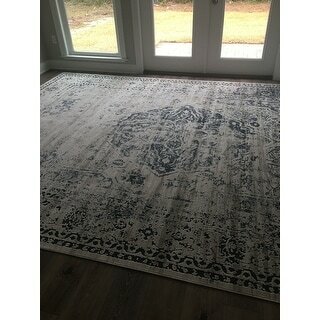 So if you want a pretty cream rug and the dimensions don’t matter so much, this is a nice rug for the price. 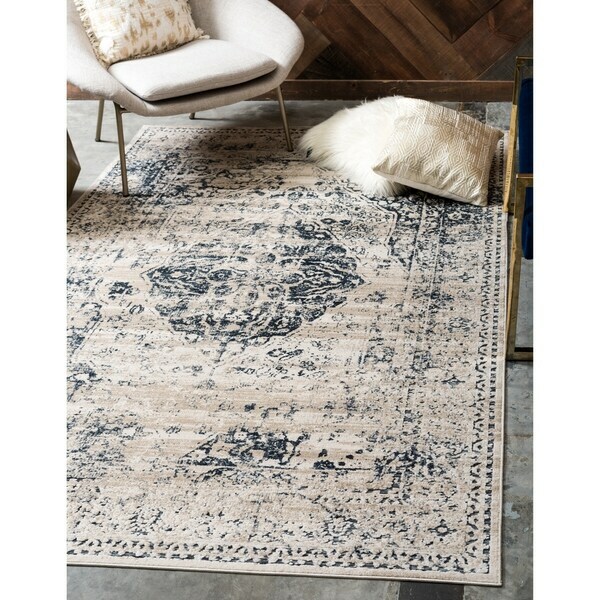 If you need a darker rug like the main picture and every inch counts, this is not the rug for you as we unfortunately found out. Im in love. When the shipment first arrived, the package size through me off. It seemed a lot smaller then what i had anticipated but once i opened the box i then realized that it was folded in half and rolled up. 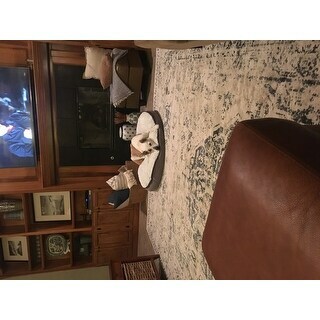 The first picture I uploaded shows the initial folds in the rug but once it’s unfolded and rolled out after 24 hours, the wrinkles in the rug went away. The texture of the rug is soft and very flexible. I debated purchasing a rug liner but since it doesn’t move even with heavy foot traffic, I’m putting off on purchasing the liner for now. I also thought the rug had grey in it but it doesn’t. It’s mostly egg white, champagne, and denim dark blue colors. This definitely still fits with my color scheme. Beautiful rug. Colors are much lighter in person, but overall very happy with my purchase. Rug material is very thin, so you may want to purchase rug pad to go underneath. Rug is more or less as pictured. There are definite blues in the rug, but not so much that it'll define the rest of the room. Agree with previous reviews that the rug is VERY, VERY thin - which doesn't bother me, but if you want something more plush, this isn't for you. To give you an idea, the rug was folded in half and rolled and could easily be carried under one arm. Overall, happy with the purchase at the price point. Gorgeous antiquey rug. The tan doesn't read as muddy or tan really. It just makes it look aged. Very thin though so I definitely recommend a pad. Very satisfied with rug, used in living room. Recieved several compliments already. Good quality with a fair price. Materials are soft to the touch. Soft, beautiful and looked perfect in my living room. My guests always compliment me on this carpet, thinking I paid an arm And a leg for it. Such a great price for this master piece. Easy care too, with all the spills we get due to my kids. Comes off easily with warm water and paper towel. Stain resistant was a huge plus point fir me. Another great buy here at overstock for me. Have been seeing this beauty on multiple sites and all over social media. Bought the 10x14 for our main living area and we love it!! Gorgeous rug, does not shed, lovely style for the price. Buying another in 8x10 for the living room in the front of our house! Loved this rug! It was perfect. The only thing is that it does get a worn look over time. We never wear our shoes in the house and it still has aged. It is still beautiful though.